A few months ago Milé and I were contemplating how to celebrate our 5th season at Small Pond Arts. It seemed obvious we should use our annual silo banner in some way, so we decided to create a call for submissions and have a guest artist design and make the banner. "I am very interested in community art projects and art that is freely available to the public. By raising a different banner every year you are able to inspire the surrounding communities of Prince Edward County to engage in artistic expression by displaying public art; I would love to be a part of that." Leanne arrived and got to work immediately in the art barn. Her approach was very different than those of our previous banners; her design was far more complex, and she used a lightweight synthetic fabric, where in the past we'd always used cotton or a cotton blend. Working from a detailed sketch, the whole thing came together remarkably quickly. It was done in a week, leaving Leanne with the second week of her artist residency to focus on other projects. We hoisted the banner at our annual banner-raising party (of course). We had a good-sized crowd there to watch it go up, and it was terribly satisfying to hear all those "oohs" and "aaaahs" as the image revealed itself. Leanne's initial inspiration for the image of the pileated woodpecker was the symbol for a fifth wedding anniversary: wood. She colour-matched the base fabric to the colour of the silo, transforming the silo into a giant tree stump. This species of bird is native to Prince Edward County, and it's always a thrill to see one in action and admire its distinctive markings. We think the banner turned out brilliantly, and we're so lucky to get to look out our windows and see this work of art every day! 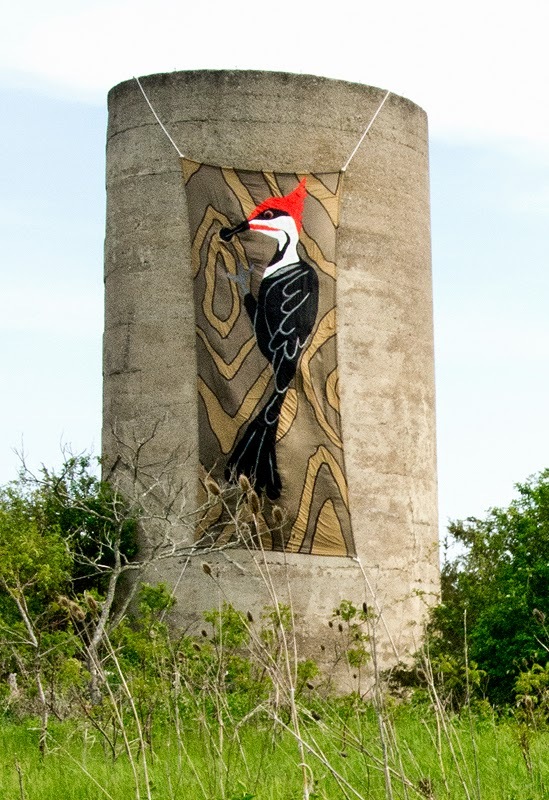 Our beautiful woodpecker banner will be on our silo all summer - drop by and see it for yourself! Congratulations to Leanne Shea Rhem on creating such an inspiring work of art. If you'd like to find out more about her or see more of her work, check out her website and blog.